Valves are linear-lanceolate to elliptic-lanceolate, with broadly rounded rostrate to capitate ends. Valves have a strong subapical constriction, except in the smallest valves. The axial area is lanceolate, spanning approximately 1/4 of the valve at its broadest. The central area is bow tie-shaped and incomplete, with marginal striae alternating in length. Striae are radiate throughout, with a slight bend or curve halfway to the valve margin. Stria density increases from 24-26 in 10 µm at the center of the valve to 28 in 10 µm near the apices. Raphe is nearly linear and lateral, with slightly inflated proximal ends and oppositely deflected distal ends. At the termination of the valve there is a small internal notch or depression, visible in LM. Distinctly visible hyaline areas are present at the valve ends. Areolae are not visible in LM. This species has heretofore not been recorded in North America. 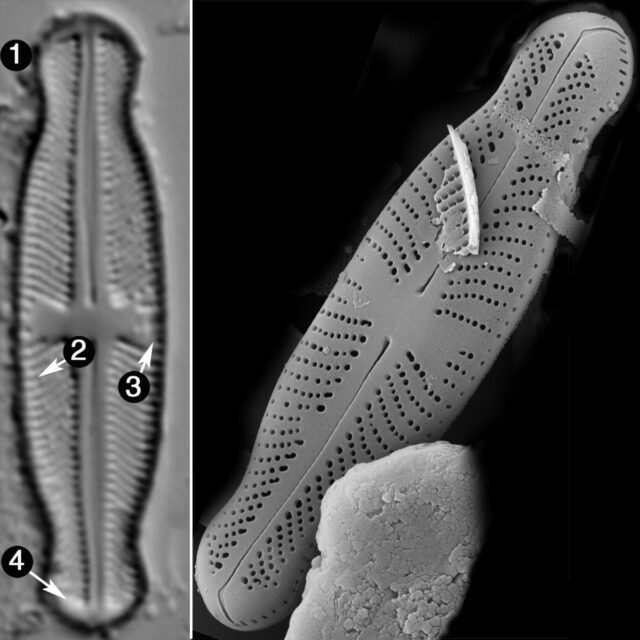 However, this is likely due to misidentification as the very similar Navicula ruttneri var. capitata. The U.S. Geological Survey database (BioData) shows this name has been commonly reported in the southeastern United States. It should be noted that the type localities for Sellaphora japonica and Navicula ruttneri var. capitata are Japan and Indonesia, respectively. The type locality of Sellaphora japonica is Ishimi-gawa, a tributary of Ahiri-gawa, which is itself a tributary of Ara-kawa, where Kobayasi first discovered it. 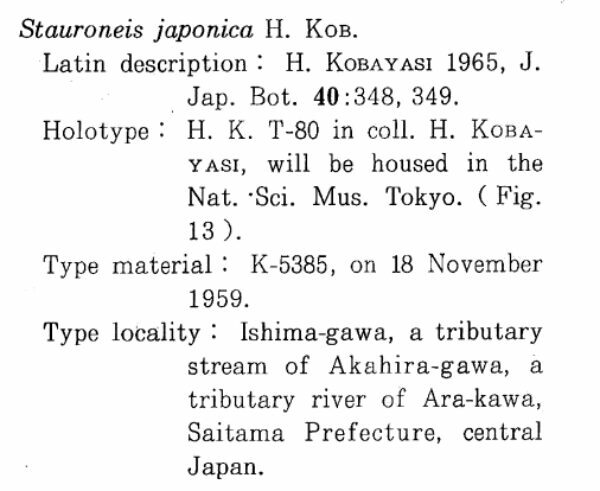 Beyond this drainage, Mayama and Kobayasi (1986) note that this taxon has been found in mosses from Nakatsu Gorge, Arima Valley, and Nippara-gawa as well. The imaged populations for this taxon page derive from samples collected in the southeastern United States. 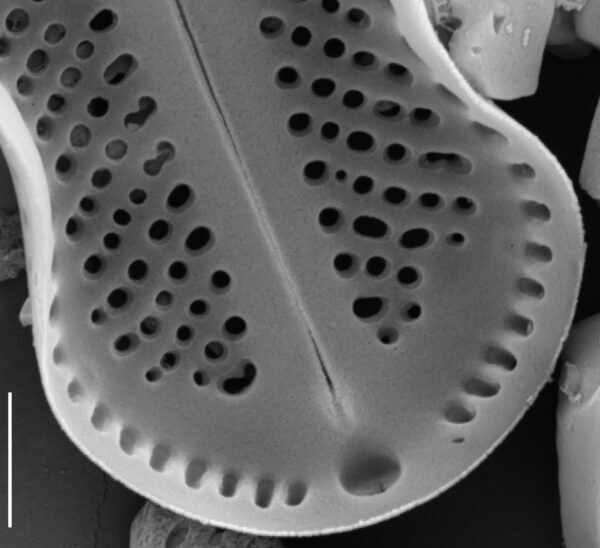 This contributor could not find any records of S. japonica in North America; this is possibly due to misidentification as Navicula ruttneri var. capitata. Valvis 15-25 µ longis, 5 µ latis, inflationibus apudo medianam et terminales magis distinctis, area axiali angusta, zona ampla hyalina cincta, stauro amplissimo, versus marginibus valvae semper dilatato, striis radiantibus, centralibus 24 in 10 µ, terminalibus 28 in 10 µ, sbtiliter punctatis. 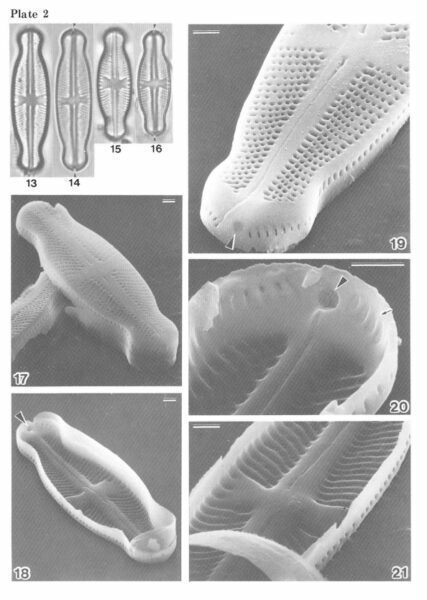 Kobayasi, H. and S. Mayama (1986) Navicula pseudacceptata sp. 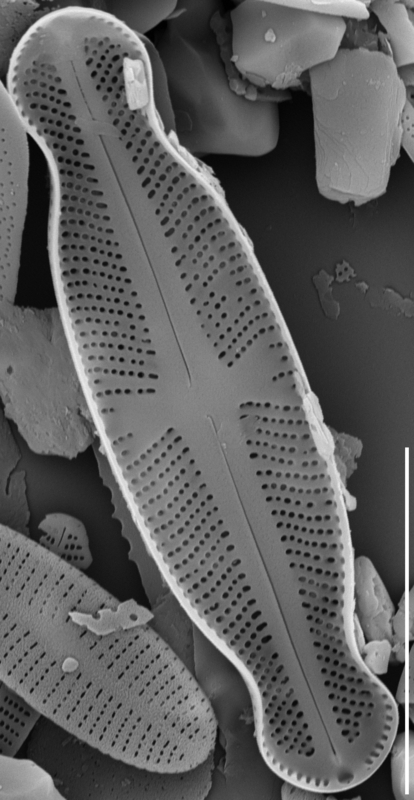 nov. and validation of Stauroneis japonica Diatom 2: 95 –101. Valves with broadly rounded rostrate to capitate ends. Central area is bow tie-shaped and incomplete, with marginal striae alternating in length. Striae are radiate throughout, with slight bend. Distinctly visible hyaline areas are present at valve ends.